A very neat and elegant folding cane with a petite handle suitable for smaller hands. The pattern features pink, blue and purple flowers on a black background. Both the light and strong aluminium shaft and the plastic handle are patterned. The shaft folds into four sections. The sections meet with an end-to-end 'easy-joint', which is easily managed by those without much strength in their wrists. Fitted with a rubber ferrule and smart metal collar. Ferrule diameter 16mm. 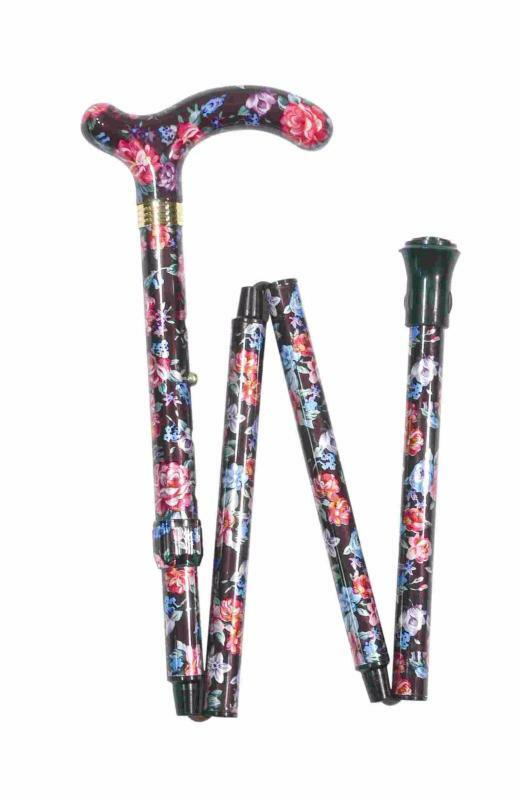 Height adjustable from 77 to 85cm (approximately 30"-33.5").